The silence amidst the vast open space is one of the things that moves me the most. Snow is falling. Tiny, perfectly shaped crystals. They catch in Jen's hair like little stars, and I smile. I can't stop looking around me. The ice stretches infinitely on all sides. Black mountains covered in delicate white; creeks tumble over dark rocks. We step nimbly over them with our crampons, and continue the hike. 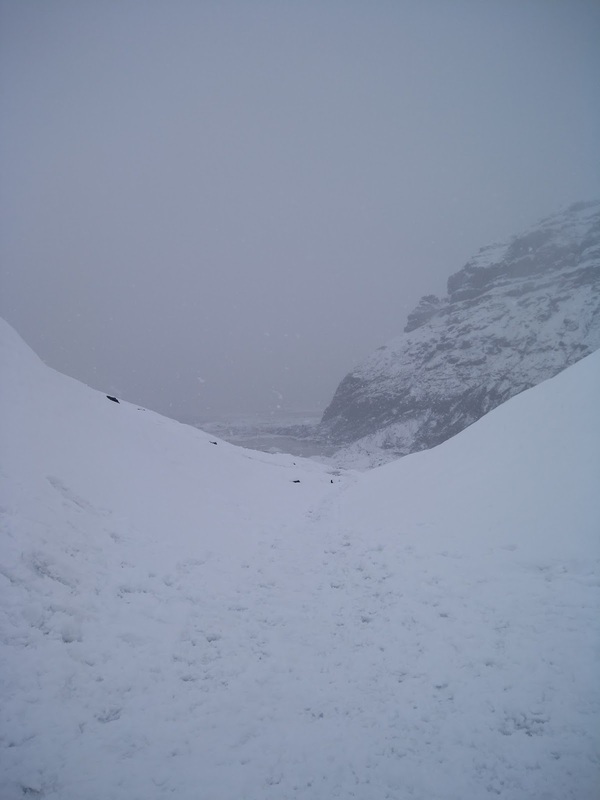 The dark grit of volcanic soil crunches under our feet and under the snow. In the far distance, bright blue ice glows from beneath the layer of fresh snow. We are on a glacier and ice cave hike with a guide. For the next two and a half hours, we are in this remote, inaccessible area, with only our crampons, helmets, and a guide to keep us safe. The footpaths meander up and down the glacier, snaking their way slowly to our target destination - a naturally formed ice cave. This cave was formed by water running through the glacier, and the location of each "cave" is different every year. It was truly mesmerizing to be inside a glacier. I ran my hands along the smooth, packed "cave" walls, looking at all the little bubbles and particles embedded in the ancient ice. Eventually, we come out of the cave, and continue our hike to see different features of the glacier, occasionally stopping for photos. A thought that's been in my head for the past few days came to mind again as I looked at everyone taking constant photos. I've been wondering what vacation places looked like, before the proliferation of cameras and cell phones. Did people just... look around them? I guess I'm showing my relatively young age with that question, even though I'm in that in-between generation that had a childhood and adolescence without technology. Of course, I take photos too. But I actively try and breathe in these experiences. Slow down my pace, and just look around me. Memorize not just what it looks like, but what it FEELS like - the photos can't do that for me. This inner stillness; this hypnotic feeling from the vast emptiness around me. 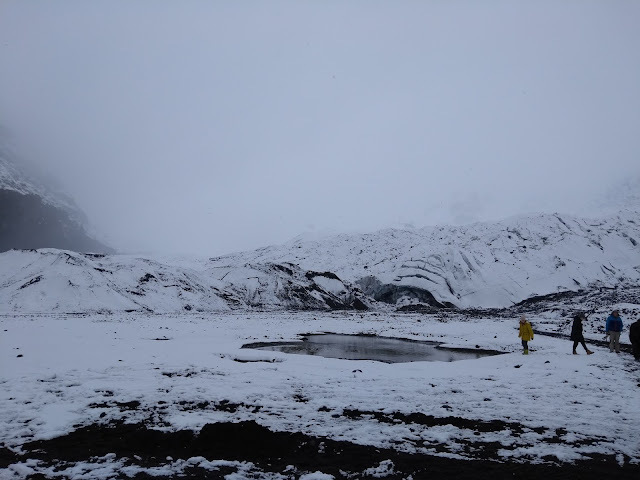 The glaciers are imperceptibly moving, just liked the tectonic plates in Thingvellier, just like the imperceptible but very real growing and aging of every person, every plant, every animal. This landscape is not frozen and barren; the silence is alive, moving, rich and full. Perhaps that is part of what is so hypnotic about it. We eventually leave the glacier and make the hike back to where the 4x4 bus is waiting to pick us up and take us back to our cars. We make ourselves a mocha in the back of the campervan, and warm up while we reflect on our adventure. After resting for a short while, we decided to hike to one of the other main attractions in the park, Svartifoss (if you haven't figured it out by now, "foss" means waterfall). The signs promised us an "easy" hike of about 35-40 minutes each way, but we soon figured out that Icelandic of "easy" means "up a never-ending steep ascent for almost an hour". Perhaps it was our morning-long excursion on the glacier, but the hike to Svartifoss took a lot out of us and we went slower than our usual pace. Finally, though, we reached the waterfall - and it was all worth it. sand beach near Vik. Even though there are some people at the base of the falls, it's nowhere near the number of tourists at places along the Golden Circle, so I am content. I climb over a few rocks in the creek and have a seat on a large boulder, and just sit and watch the falls. I close my eyes for a moment just to focus on the sound of falling water. I open them again and stare at the crashing water, the other-worldly columns, and the small shelter of ice that has grown behind the falls. I feel exhausted but fulfilled. The snowflakes are gently falling on my cheeks and hair, and I turn my face up to the sun, closing my eyes again. This is happiness. This was so beautifully written! I love what you said about the silence being alive and moving. When I look at pictures of bare, snowy landscapes I see them as cold and dead, but I forget that subtle feeling of electricity that you feel when you’re standing in the crisp, silence. Thank you for painting this rich picture and reminding me of the beauty of winter wonderlands!